September | 2013 | Not Your Average Hockey Blog. In the fifth spot, we have Edmonton Oilers star Jordan Eberle! Jordan was drafted 22nd Overall in the 2008 NHL Draft. Many Canadian hockey fans will remember him for this memorable goal: (Sticktap to p00jabiHD for uploading this). Check it out! Do you have any other differences from our lists? Let us know! Do you agree with ISS? Let’s us know what you think, comment below! Have You Met Nikita Korostelev? Do you know who Nikita Korostelev is? If you do, that’s great! If you don’t, let me introduce him to you. He was drafted 9th Overall in the OHL Priority Draft. He came to Canada when he was just 14 years old. He’s about to start the season, and you can follow him on his journey by following him on Twitter: @MrKrostik! You can follow me on Twitter: @HkyBlogger, and “like” us on Facebook here: https://www.facebook.com/notyouraveragehockeyblog. Without further to do, here is our interview with Nikita Korostelev! As per usual, we are in bold. It was just a regular day with workout, team practice and a little game of COD with some buddies. What’s the gameday routine for you? The game day is always same for me, with a little skate in the morning, pasta 4 hours before the game and little 45 minute nap. Do any of your teammates go absolutely nuts with the superstitions? Well, every hockey player has his own habits before the game including me, one of which is taking a really cold shower before going to the rink. On to more hockey related things, You moved here at the young age of 14 without your parents, was the first year tough? The first couple months were tough, because my English wasn’t really good. I came here to Canada because I wasn’t growing as a hockey player in Russia. You’ve been quoted as saying that you moved here to better your chances of getting to the NHL. Did you ever consider just going home instead of playing in the OHL? Right now I don’t even think about going home, all my thoughts are about this season with the Sting. 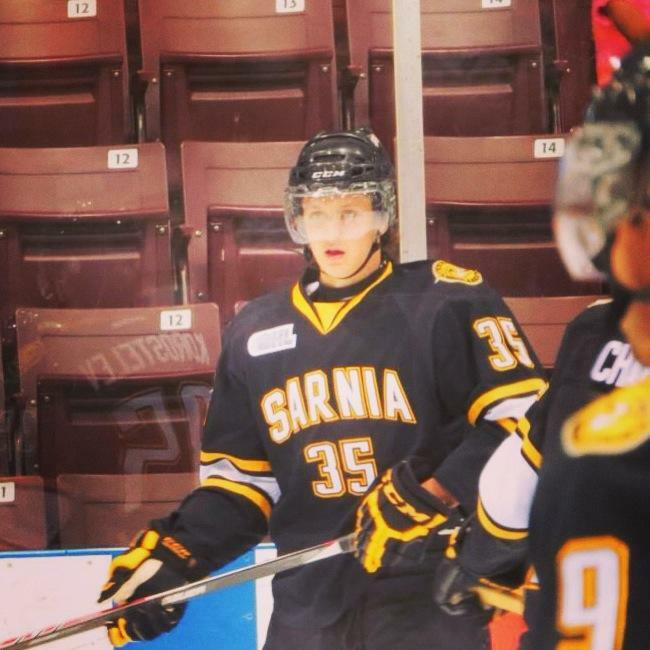 How great was the feeling of getting drafted to the Sarnia Sting with the 9th Overall pick in the 2013 OHL Priority Draft? I can 100% say it was the best feeling in my life when I heard my name. How excited are you for the OHL season? I’m really excited, and glad I have this opportunity. It was in Russia, we had the biggest tournament in the country and I scored 5 goals in the final game. The next part is a rapid fire round! Don’t think about your answers, just answer them! If you weren’t aspiring to be a hockey player what would you want to be? Best part about playing in Sarnia? I can really grow as a hockey player. Final questions: Who should we interview next? As per usual we are in bold. First things first, you were sent home a few days ago when your concussion symptoms returned. How are you feeling? Yes but I am feeling better thanks for asking. How frustrating is it to wake up one morning and have headaches? It is pretty tough dealing with things like headaches because I can’t really do much about it. I try not to let it ruin my day and I focus on the great blessings I already have in my life. How do you deal with the frustration? I try to be positive and look at the bright side of circumstances like this. Going to church and having a personal relationship with God has helped me to accomplish that. My great family and friends are also really important during this. How many concussions do you think you’ve had over the years? I believe this is my first concussion I’ve had that has kept me from doing something. Let’s move away from the negatives of your career into happier times shall we? What was it like to lead the Owen Sound Attack in 2010-2011 to their first J. Robertson Cup since 1923-1924? It was an amazing feeling to help the Owen Sound Attack have a long and successful season during my rookie year. They’re such a great group of people in the organization. Is there added pressure with getting an ‘A’ on your jersey at such a young age? I was really thankful to receive an ‘A’ at such an early age in the league. I knew I was mature enough to take on the role but definitely still had a lot of learning to do. The ‘A’ didn’t add pressure; it made me want to prove I could handle it. What was it like to be drafted by the Ottawa Senators with the 82nd pick in the 2012 NHL Draft? It was a fantastic feeling being drafted by Ottawa. It was a moment in my life that I will never forget. Where were you, who did you hug first, and what was the first thought in your mind when they announced your name? I was at the draft live. I think it was my dad I hugged first. The first thought that entered my mind was instantly thinking about how I had family in Ottawa and near it. As a kid I always knew Ottawa as a trip to go see family members once a year. Besides the draft, what has been another highlight of your career you will never forget? I will never forget scoring the overtime goal in Game 7 of the OHL championship to help Owen Sound defeat Mississauga. Has there been one particular lowlight that stands out unlike the rest? My concussion injury has been the lowlight that stands out to me. It’s been a hard battle at times but I’ve been able to get through it one step at a time. The next part is a “rapid fire” round. This is where the fans get to know you in a personal level. Don’t think at all. Just answer! As a hobby I love to play ping pong and my guitar. I have never had an awkward interview yet. Ever had a really awkward experience with a fan? I can’t think of any awkward experiences with a fan at the moment. Do’s and dont’s of approaching Jarrod Maidens? I don’t have any do’s or dont’s when it comes to approaching me. Just be yourself! Secret people don’t know about you? I like to talk in my sleep. We have two dogs and a hamster. I love a nice steak dinner. Devon Rymarchuk aka @devonrymar is a good friend and old teammate in Owen Sound who is now with Barrie. He’s a great person and competitor on the ice. Advice for aspiring hockey players? My advice to aspiring hockey players is work hard and enjoy every minute of it. Each day gone is one you can’t get back. Appreciate everything in your life that you have. Thanks a lot for the interview! God bless. My day has been good, I moved home from school a week or so ago so and I’ve been enjoying time with my family which has been great. What’s your game day schedule like? My game day schedule is breakfast at 10:00AM then pre-game skate at 12:30PM. We usually have a team meeting at 1:45PM. Then a meal at 2:00PM. Then I usually go back and play video games or nap for a little. So it’s pretty busy. I wish I had a little more down time on game days. Your go to video game? My favourites are Madden, FIFA, and NHL. I like Call of Duty too but I put most of my time into Madden, FIFA and NHL. Haha sounds fun! Do you have any pre game superstitions you have to follow? No I don’t really believe in that kind of stuff I just like to have fun and enjoy it. Ever had a teammate that went crazy with them? Haha I’m not too sure I really don’t pay attention to that kind of stuff I just think it’s so ridiculous but one of my good friends always kisses a Peter Forsberg card before he goes on the ice. Haha, the card must be pretty gross looking by now! So what was it like to play under legendary coach Jack Parker? It was definitely pretty special to get that opportunity especially growing up in the Boston area. I always dreamed of playing at BU and to play for Coach Parker, means a lot to me to be fortunate enough to get to say I played for him. Did you or any of the guys get emotional when you learnt he would be retiring? I wouldn’t say we got emotional but at that same time we knew that someone who meant a lot to us and to the school who had been there for 40 Years was leaving and we all were kind of shocked and sad to see him go. But at the same time, happy that he gets to enjoy time with his family and do things that he loves to do, which will be nice for him. He deserves a vacation I think. What’s the most important thing coach Parker has taught you? It doesn’t have to be hockey related! The most important thing he probably taught me was probably just doing things the right way and how important it is to surround yourself with good people. I think just being around him every day and how he’d been at BU for forty years but each day he came to the rink like it was his last day there, I think that rubs off on people and you see his passion and you want to win for him. So on to the NHL, tell us what it was like to get drafted to the Nashville Predators in the 4th Round of the 2011 NHL Draft? Were you at the draft? Who did you hug first? It was pretty special getting drafted I was excited and to get drafted to a team that develops defenseman as good as Nashville does was A good feeling. I was not at the draft so there was no hugging going on. I was at the rink and had just skated. When I found out I called my parents and my two brothers and sister and they were all really happy for me. Were you skating alone when you found out? I was just out skating with some guys on my team playing 3 on 3. Did you freak out to them when you found out? Haha I wouldn’t say I freaked out but I was excited and it was good to see two of my classmates had been drafted in the same draft too. Let’s give a shoutout to them! Who were you classmates who were drafted along with you? So what has been the highlight of your career so far? The highlight of my career so far was definitely winning the RBC Cup which is the national junior A championship in Canada with my junior team the Vernon Vipers. What has been your lowlight of your career? Probably getting hurt last season separating my shoulder which basically ended my season. That was the first time in my life I had missed hockey games because of an injury and it was really hard for me to deal with. But overall I think I took a lot out of it and it’s made me mentally tougher. The next part is more of a rapid fire round! Baseball was always my favourite sport. I still love going out and playing catch and watching baseball all the time. Something people don’t know about me is that I love to be with my family. Best prank you’ve done or seen? Best prank I’ve seen is probably when one of my teammates hid another ones hockey bag after we got off the bus and the kid thought He forgot his hockey bag at our home rink when the game was away. That must have freaked him out like crazy! Haha! One NHL player you wish you were? My favourite NHL player is Logan Couture. Haha not sure who you should do next lots of guys I’m sure would love to. Advice would just be just have fun and attitude is altitude.